Spanish commentator and translator; lived in the second half of the fourteenth century in Guadalajara, where he probably was born. The spelling of the name, or , is uncertain. Wolf ("Bibl. Hebr." iii. 1113) is uncertain whether to read it "Moṭoṭ" or "Miṭṭoṭ." The first form, though not yet explained, is now usually accepted (see Steinschneider, "Hebr. Bibl." xv. 16). Samuel is best known for his "Megillat Setarim" (Venice, 1554), a commentary on Abraham ibn Ezra's commentary on the Pentateuch. The work soon became very rare, and was subsequently published in abridged form by Jekuthiel Lazi in "Margaliyyot Ṭobah," a collective edition of commentaries on Ibn Ezra's commentary on the Pentateuch. A better revision than the Venice edition is preserved in some manuscripts (see Schiller-Szinessy, "Catalogue of the Hebrew Manuscripts Preserved in the University Library, Cambridge," Nos. 49, 50; J. Goldenthal, "Die Neuerworbenen Handschriftlichen Hebräischen Werke der K. K. Hofbibliothek zu Wien," vi. 98, Vienna, 1851), Cambridge MS. No. 49, written about 1380, probably in Guadalajara, containing the fullest and in many respects the best revision. In this supercommentary Ibn Moṭoṭ displays a profound knowledge of the Talmud, the Cabala, and philosophy. While in astronomy and astrology he follows Ibn Ezra as his principal authority, he accepts rather Naḥmanides' views in regard to Talmudical and cabalistic problems. He defends Ibn Ezra's commentary against the accusation of having thought and spoken of rabbinical authorities without sufficient respect. Ibn Moṭoṭ himself, however, had a low opinion of Ibn Ezra's orthodoxy and Talmudical knowledge on the whole, for, as he thinks, Ibn Ezra did not go very deeply into mysticism (Schiller-Szinessy, l.c. p. 138). He quotes in this work Aristotle and his Arabic commentators, also cabalists, scientists, philosophers, astronomers, and linguists, as Abraham ibn Daud, Maimonides, Joseph Ḳimḥi, Naḥmanides, Isaac Israeli, and Joseph ibn Waḳar. It is also a very rich source of information with regard to Abraham ibn Ezra's numerous works, to which it contains many references. Ibn Moṭoṭ wrote also: (1) a cabalistic commentary on the whole Pentateuch, although only the portion on Exodus has been preserved (Neubauer, "Cat. Bodl. Hebr. MSS." No. 286; Goldenthal, l.c. 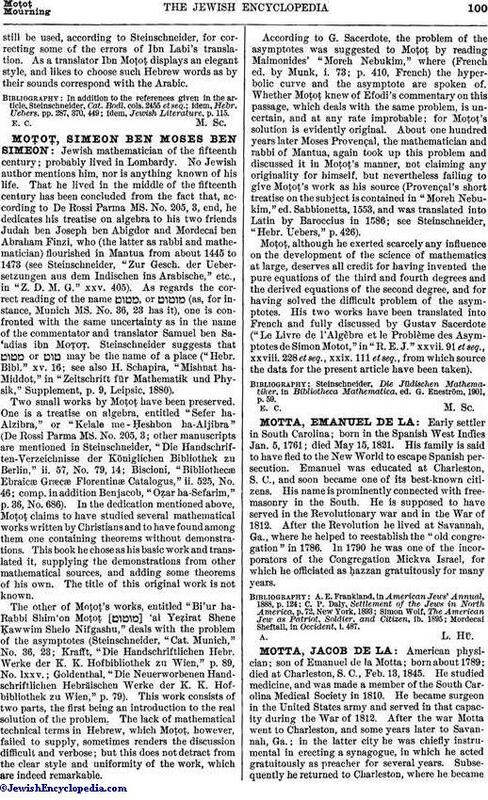 p. 7); (2) "Sefer Tehillot Adonai" (Neubauer, l.c. No. 1648; Benjacob, "Oẓar ha-Sefarim," pp. 62-112), a cabalistic commentary on the daily prayers and the Haggadah, a portion being printed as a supplement to Menahem Recanati's "Perush ha-Tefillot" (Constantinople, 1543-44); (3) "Meshobeb Netibot" (after Isa. lviii. 22), a cabalistic commentary on the "Sefer Yeẓirah," written in 1370 at Guadalajara, and of which many manuscripts exist (see Neubauer, l.c. Nos. 1594, 2, and 1647, 5; Paris MSS. Nos. 769, 124, 9, and 842, 2; Steinschneider, "Cat. Bodl." col. 2456; idem, "Hebr. Bibl." vii. 113, xv. 16). The last-mentioned commentary is divided into three parts, each of which contains six chapters. The first part, which is the introduction, deals with numbers, mankind, intelligence, etc. The second part contains the commentary proper; and the third part consists of various theses on subjects dealt with in the "Sefer Yeẓirah." As a whole, according to Steinschneider, the book represents a mixture of philosophy, astronomy, and Cabala which is characteristic of the age in which the author lived. The first four chapters of this commentary, containing a Hebrew translation, from the Arabic, of "Al-Ḥada'ik" by Baṭalyusi, have been published, together with Ibn Tibbon's translation of the same work, by D. Kaufmann in "Die Spuren des Al-Batlajusis in der Jüdischen Religionsphilosophie," pp. 17 et seq., Budapest, 1880. 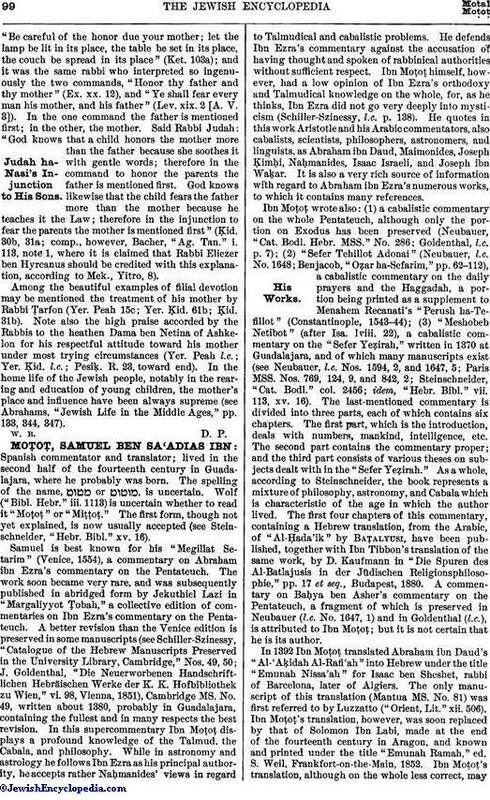 A commentary on Baḥya ben Asher's commentary on the Pentateuch, a fragment of which is preserved in Neubauer (l.c. No. 1647, 1) and in Goldenthal (l.c. ), is attributed to Ibn Moṭoṭ; but it is not certain that he is its author. In 1392 Ibn Moṭoṭ translated Abraham ibn Daud's "Al-'Aḳidah Al-Rafi'ah" into Hebrew under the title "Emunah Nissa'ah" for Isaac ben Sheshet, rabbi of Barcelona, later of Algiers. The only manuscript of this translation (Mantua MS. No. 81) was first referred to by Luzzatto ("Orient, Lit." xii. 506). Ibn Moṭoṭ's translation, however, was soon replaced by that of Solomon Ibn Labi, made at the end of the fourteenth century in Aragon, and known and printed under the title "Emunah Ramah," ed. S. Weil, Frankfort-on-the-Main, 1852. Ibn Moṭoṭ's translation, although on the whole less correct, maystill be used, according to Steinschneider, for correcting some of the errors of Ibn Labi's translation. As a translator Ibn Moṭoṭ displays an elegant style, and likes to choose such Hebrew words as by their sounds correspond with the Arabic. idem, Jewish Literature, p. 115.